As every single one of us should be aware, the National Security Agency (NSA) has increased its phone-tapping and internet supervision with guns a-blazing since 2001. The Guardian released a piece in June stating that the NSA had a court order sent to Verizon Wireless requiring them to monitor and report the phone records of millions of Americans. Debate surrounding the criminal status of Edward Snowden (former NSA analyst, whistleblower and soon-to-be T-shirt icon for people in Guy Fawkes masks) aside, the bigger issue here arises when the United States decided to do next to nothing about this big curtain drop. All U.S. citizens gave a collective shrug and went back to waiting for “Grand Theft Auto V” to come out, and the government went on to monitor our spotless browser histories in peace. The Obama administration seemed content to declare it necessary to prevent terrorism and say nothing more until the news gets upstaged by the revelation that the NSA monitors not only the United States’ own citizens, but heads of foreign allies as well. 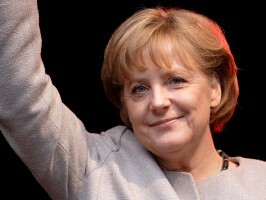 The newest controversy surrounds mainly German Chancellor Angela Merkel, the head of government over in Deutschland. In late June, we learned of NSA’s surveillance on European embassies, as well as ordinary citizens across the pond, particularly in Germany. The German newspaper Der Spiegel released a piece claiming that up to 500 million German data connections – phone calls, texts, emails – had been collected by the NSA every month. Here is where things get really soap-operatic. Der Spiegel released a report in July stating that the German government themselves had used a program developed by the American National Security Agency, called XKeyScore, to perform surveillance of their own. Because we’re allies, right? Guys? Another piece from your friendly neighborhood Der Spiegel published on Oct. 23 unveils that Chancellor Merkel’s personal cell phone had been tapped by the NSA, for what was later revealed to be over three years, if not more. This move was proposed by NSA heads, and despite claims by senior White House officials, approved by President Obama in 2010, according to the UK newspaper The Telegraph. This proved once and for all that the NSA is on par with 14-year-olds when it comes to forming alliances and then using modern technology to destroy them. In the wake of this sizeable slip-up, President Obama announced an independent panel would be established in order to review the NSA’s practices, stating in an interview with Fusion that the review will make sure “what they are able to do, doesn’t necessarily mean what they should be doing.” Apparently now is suddenly the time to maybe look into this. I understand the American public typically isn’t one for confrontation, especially if it’s in the name of changing something they have grown comfortable with, like the internet. But aside from our country’s rather worrisome lack of concern surrounding the first telltale signs of an Orwellian I-told-you-so, the general sense of indifference surrounding this whole controversy says a lot about the current attitude our government has about its citizens and about its interests abroad. Americans protested the NSA surveillance. I know it wasn’t that many people. Sometimes Breaking Bad is just too good. But upwards of 500,000 innocent American citizens wrote petitions, played the lobby game and pulled some old fashioned marching in the streets to send a message of “dude, not cool,” to the boys upstairs. The public is aware. Many are not happy. Members of the Albion community beside myself have also weighed in on the issue. “I find it ridiculous that the U.S. felt it had the right to bug an allied country official’s phone,” said Austin McKee, Rockford sophomore. For some, the concern finally ties back into our domestic spying. McLean went on to say that the events of the past several months have proven the NSA’s inability to police itself and that the inevitable reforms may now potentially damage national security. I also understand that this entire dilemma is based around the argument of national security, but let’s bring into account the averted attacks on the United States that have taken place since September of 2001. * Richard Reid, the “Shoe Bomber.” A man stopped in the act of attempted airplane bombing by passengers on board, not by security, airport or national. *The 2010 Times Square Bomb plot, the attention of which was brought to the bomb squad by two New York street vendors, not bugging and surveillance. *Umar Farouk Abdulmutallab, the attempted “Underwear Bomber” of Delta flight 263, a man betrayed by the poor functionality of the very trousers he trusted. *The 2010 Cargo Bomb plot, in which allegedly al Qaeda sourced bombs found their way onto a FedEx flight out of Yemen, before Saudi Arabian intelligence warned the plane staff of their presence. Not a single one of these botched crimes owes its failure to the vigilance of the National Security Agency, or even an American-based authority. The idea of abandoning our right to privacy and the legal necessity of a warrant for the sake of security is pushing it, even before we flip over the NSA’s rookie card and check out the track record. If the NSA’s surveillance had actually foiled as many potential threats as it claims it is designed to do, wouldn’t now be the time to let the American people know about it? The cat’s out of the bag, so why keep positive instances classified when the revelation of all the good they are supposedly doing would be undeniably beneficial to them right now? That said, it seems like we have a bit of moral debt to those friends of ours overseas who have actually kept up defense against this terrorist boogeyman we’ve heard so much about. A potential post-9/11 attack, known as “The Pakistan Matter,” was averted from within Germany when, during the 2007 G-8 Summit, one Chancellor Angela Merkel passed the word of the threat from her security officials to a nearby George W. Bush. And here we are, six years later, our ear cupped to Merkel’s bedroom door like we’re Lizzie McGuire’s little brother. Americans are easily paranoid. Our hobbies tend to consist of retreating into our homes like a hermit crab on “Cribs,” bathing in media and absorbing the sensationalist, fear-mongering journalism that’s typically presented to us. Less than half of Americans feel safer about terrorism in the wake of the Patriot Act and the revelation of the NSA spying. The secrets are out, and if there was any time for those officials to show us what all this work is for, it’d be now. I’m sure we’re all plenty scared of the faceless, liberty-hating monster out there in the darkness, who plans to do terrible things because of how much he envies the freedoms we enjoy. I’m sure we all appreciate you neutralizing his piqued interest by helping chop down that list of freedoms a little more every day. I’m sure an explanation is now suddenly due after a foreign country raised concern, long after your own citizens did. Opinion: Equality in the U.S.A.